You will most often have two distinct versions of your Photoshop files; one for design and one for production. Your design files include all of your layers, vector type, blend modes, and layer effects. These are meant to be editable in the future so you can make client changes. Production files on the other hand are meant to be imported into your NLE/Compositing Application/DVD authoring environment. These often contain flattened layers and must have their layer effects merged as well. Production files are often saved into a portable (easy to move across applications and platforms) format such as PICT or TARGA. By employing the two-format method, you will ensure maximum flexibility and compatibility. A standard square and NTSC D1 pixel. Remember, video is displayed on standard televisions at a 4X3 aspect ratio. Even video that has a different native size must be eventually converted. Natively, an NTSCD1/DV pixel is taller than it is wide, approximately 0.9 to 1. PAL pixels on the other hand are wider than tall, 1.07 to 1. • First, there are many conflicting opinions on what size to build graphics and what application to use when resizing them. These opinions are all based on combinations of facts and circumstances, so make sure you understand both before choosing a method. • Second, read the manual that shipped with your editing software because different companies have their own procedures for each editing system. I will attempt to address the most common workflows, but it is a good idea to keep up with changes in your video software. • Third, if using Photoshop CS or later, you will generally choose to build your graphics with the nonsquare pixel presets. Notable exceptions will be some flavors of HD or if building graphics for use in After Effects 3D space. With those three points made, I will present your options for building graphics that will work for most users on most systems. Frame size can be found in your NLE's manual, or you can export out a single frame. • If you are working with a traditional (switcher-based) analog system, the frame is likely equates to 648X486 for NTSC or 768 X 576 for PAL (using square pixels). • Most hardware-dependent nonlinear systems that are capturing sources such as Beta SP use the ITU-R BT 601 format (often referred to as D1). The native size is 720X486 non-square pixel image for NTSC or 720X576 nonsquare pixel image for PAL. • In the last few years, many DV solutions have appeared, including DVCPRO and DVCAM. These use a 720X480 nonsquare pixel image for NTSC and 720X576 nonsquare pixel image for PAL. The following table sheds some light on the various native sizes you'll encounter. See the Working with Document Presets video tutorial on the DVD-ROM. (Left) Original image viewed viewed in NTSC D1 editing system such as Avid Media Composer. (Middle) Same image viewed in Photoshop with NTSC standard (with no Pixel Aspect correction). (Right) Same image viewed in Photoshop with PAL standard (with no Pixel Aspect correction). Depending on your version of Photoshop, your technique will vary. Starting with Photoshop CS, Adobe has offered the monumental change of nonsquare pixel support. Despite this support, not everyone will choose to use nonsquare pixels. Reasons vary but include tradition, resistance to change, or established workflows. Since Photoshop CS, Adobe supports nonsquare pixels. . . . Life is good! • Create all new documents using the built-in templates that match your edit system. This can be found in the New Image dialog box File>New or by pressing IX+© (1L+CT) The list of presets has continued to grow and currently stands at 15 for Photoshop CS3. If working with square pixel images (such as those from scanners, stock photo collections, or digital cameras) be sure to correctly interpret the pixels. This can be done in three ways: ° Drag the square pixel images into a nonsquare document. 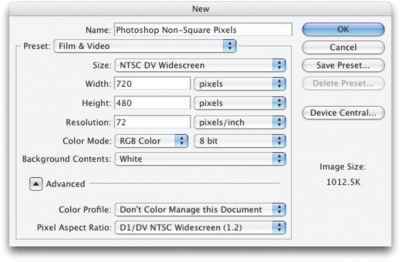 Photoshop will convert the square pixels to match your current document's settings. ° Open an image and select it by choosing Select>All then press jj-a+© (^0+©) to copy it to your clipboard. Paste the square pixel images into a nonsquare document by pressing (j+Q (L+Q). ° Place square pixel images into a nonsquare document by choosing File>Place. The image will be added as a Smart Object, which can be scaled with greater flexibility. If you are working with a frame grab or exported frame from a video editing application that uses nonsquare pixels, you will likely need to identify it to Photoshop. After opening the image, choose Image>Pixel Aspect Ratio and select the right preset for your country and screen shape. ^ You can quickly find out the details of a document by O+clicking (©+ click) on the Document Info bar. 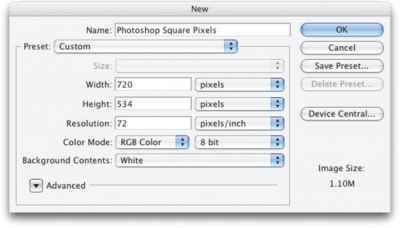 If you are designing your graphics in Photoshop 7 (or earlier), you are using square pixels. When a design is finished, you then need to resize your graphic for video usage and force the pixel aspect ratio to change. There are two major camps: those who recommend stretching horizontally and those who prefer vertically. In the spirit of The Sneetches by Dr. Seuss, I'll call them the 'Zontals and the Verts. Every edit system and manufacturer has unique requirements. Be sure to see Appendix C for specific suggestions for leading editing and motion graphics applications. (Image>Image Size, Constrain Proportions unchecked) to fill the video screen. Eventually this image will be squeezed back when playing back on televisions. The Verts counter that it is always better to shrink raster images than to blow them up. For example, by employing a 720X540 image in Photoshop, the files can be scaled down (as opposed to up). Before saving the file out for video editing, the file must be resized (Image>Image Size, Constrain Proportions unchecked). The 720X540 file is squeezed vertically to 720X486. This vertical stretch will be counteracted by the horizontal stretch when the image is transferred to video. * You will see varying numbers depending on which manufacturer's documentation you look at. For example, Apple recommends for NTSC D1 Widescreen 853 X 486 while Adobe recommends 864 X 486. The differences are very minor (approximately 1%) and will not be visible to the naked eye. 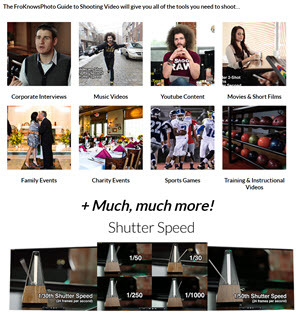 With NTSC video, the image updates 60 times per second. These fields reduce image flickering by refreshing every other line. 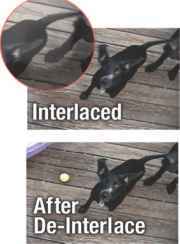 To clean up an exported video frame, you will likely need the De-Interlace filter. There are strengths to both the Vertical and Horizontal arguments if you need to design with square pixels. Because DV is having such an impact, I recommend designing at 720X540, using a 4X3 aspect ratio if you're stuck in an older version of Photoshop. This size also works for PAL graphics as well. After resizing to the Native Nonsquare size you just need to crop for DV output. Since DV lacks six lines of information (480 versus 486). Interlacing video is another leftover technology meant to serve as a temporary fix. When television was invented, it was decided that 30 frames per second generated smooth motion. However, it took 60 images per second to reduce flicker. The problem is that the broadcast signal could not hold that much information without significant softening, and the slow speed of phosphors in the tube produced banding. In order to maintain a relatively crisp picture, the solution of interlacing was decided upon by the first National Television Standards Committee in 1940. By showing half an image 60 times per second, both goals could be met. The electron beam would scan across the tube, painting every other line. It would then return to the top and paint the remaining lines. These alternating lines are often identified by field dominance, and are referred to as upper (or odd field first) or lower (or even field first). This solution solved the problem between bandwidth, flicker, and smooth motion. It's important to note that only analog televisions are interlaced. If your video is intended for traditional output, you need to keep this in mind. Standard analog televisions display interlaced video, but newer digital televisions may show progressive scan (or non-interlaced). If you are designing for Web or CD output, you will work with non-interlaced video. Interlacing is not a big issue when you start your graphic in Photoshop, but becomes very important when importing video freeze frames or working in Adobe After Effects. In Photoshop it is important to avoid lines thinner than 3 pixels, or you will definitely introduce flicker to the image. Be sure to choose an anti-aliasing method for fine details such as text as well. If you import a freeze frame from a source with fast motion, you will likely have visible fields (areas where the two frames of video mixed and a jagged result appears). If this happens, you can choose to run the De-Interlace filter (Filter>Video>De-Interlace). 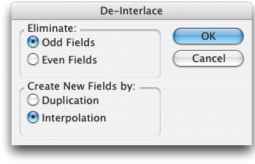 You will have the choice of keeping the odd or even field, as well as creating the replacement through duplication or interpolation. This step is especially important for broadcast designers who are working with freeze frames. If your video contains movement (and you didn't remove interlacing during export from the NLE), you will definitely see the need for this filter. Many lower-cost digital cameras will show a similar problem because they use a similar, image-capture device. It is a good idea to run this filter on video freeze frames every time if the work is to be done in Photoshop. When animating your graphics in After Effects, interlacing provides smoother movement between frames. The render times are longer, but the quality is worth it. You need to do nothing different inside of Photoshop; just make sure to turn on Field Rendering in After Effects' render settings. In fact, make it part of your presets in After Effects by modifying your output module settings. Choose to create new fields by interpolation; field elimination is a subjective choice. ^ Many editors choose to look at HSB sliders (hue, saturation, and brightness). This color model is very compatible with RGB and allows you to examine color information in a more videolike manner. Apple's Final Cut Pro system can warn you when your pixels are not broadcast-safe. Go back to Photoshop and fix the original photo when this happens. Otherwise, you have additional rendering. Did you ever play with Lego building blocks as a child? Perhaps you noticed how hard it was to build an arch or a curve. The best you could achieve still had noticeable stair stepping. Guess what, pixels are just like those building blocks. Curved or diagonal lines will not look good at low resolutions, and you must soften the edge. By choosing to use an anti-aliasing method, Photoshop will generate smoother results—especially when using selection tools (such as the magic wand or lasso tools) or vector-based type. Anti-aliasing works by softening the color transition between edge pixels. Since only the edge pixels are changed, you lose no detail in the image itself. Anti-aliasing is a useful option for creating text, making selections for filters, or copying and pasting. It will be a recurrent topic throughout this book. You can adjust the anti-aliasing for many tools directly in the Options bar. You must apply this option before a selection is made. As if the nonsquare pixels, aspect ratios, interlacing, and anti-aliasing weren't enough, let me present our next problem. 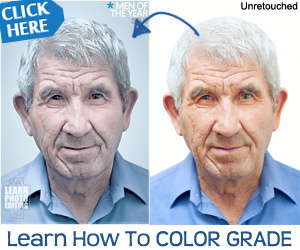 Photoshop works in the RGB color space. Each pixel you see on your monitor is comprised of light being emitted by a red, a green, and a blue phosphor placed closely together. Our eyes perceive that light as a single-colored dot, or pixel. These red, green, and blue components are referred to as channels. More on channels and channel operations in later chapters. So what's the problem? Televisions use the same red, green, and blue phosphors, right? Not exactly. Television signals are not transmitted or stored in RGB due to our final leftover problem. Initially, television was black and white. These images were actually a grayscale signal consisting of only one channel that contained the brightness information (known as luminance or luma). In an effort to keep consumers happy, color television was made backwards compatible. An RGB broadcast would not work on a black-and-white television, so broadcasters chose (and still use) the Y, R-Y, B-Y color space. The Y is the luminance information, while the two Cs represented the color components (hue and saturation). These three signals would combine to form the composited pixels. How does this affect you? Don't worry too much about the engineering side, but realize that colors will look different on a television screen than they do on a computer monitor. The color shift is minor, but present. There is no setting in Photoshop to correct this. The best solution is to have an NTSC or PAL video monitor connected to your system. If a television monitor is not an option, periodically test your graphics by importing them into your NLE, then outputting to tape or a video monitor. Photoshop and video handle luminance values differently. When working in Photoshop, black is an absolute black and white is an absolute white. Photoshop assigns a value of 0 to black and a value of 255 to white. There is no allowance for anything beyond this range. This process is referred to as computer graphics or RGB mapping. Adobe Photoshop and After Effects both work with RGB mapping. RGB mapping assumes that video black (NTSC 7.5 IRE, PAL 0mV) is assigned a value of 0, and video white (NTSC 100 IRE, PAL 700mV) a value of 255. If you import or export video from your edit system as RGB, signals above or below this range will be clipped. does not handle black and white as absolutes. It is allowable to go above "white" and below "black." One reason for this is super-black, which places a darker black in areas that are meant to be luma keyed. Many hardware-based switchers will use a luma key, instead of tying up two channels of a still store to use the fill and alpha matte. This luma key will allow for a real-time downstream key during mobile- and studio-based video production. Video cameras also allow a videographer to shoot beyond 100 IRE, giving the user some overshoot in the captured signal, which can be corrected during editing or playback. 601 mapping specifies that video black (NTSC 7.5 IRE, PAL 0mV) is assigned a value of 16, and video white (NTSC 100 IRE, PAL 700mV) a value of 235. This allows for reasonable footroom and headroom in the signal. scale to 100 IRE. Each manufacturer calls things by a slightly different name (for example on an Avid you would import with RGB levels, on Final Cut Pro you would use the default setting to process Maximum White as White option). Be sure to see your NLE owner's manual for proper details. If you are working with 601 levels (such as for an analog video switcher), I suggest you label the files as such. Just add 601 to the file name of graphics prepared with 601 compliant levels. 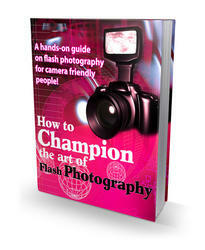 For more on broadcast-safe color, see Chapter 9, "Color Correction: How to Get It Right."